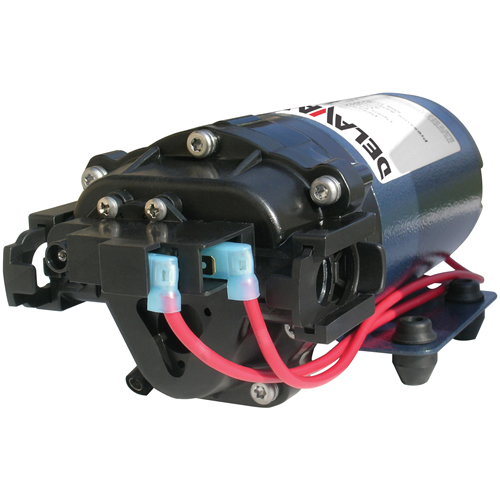 2.2 GPM 12v Demand Pump with Quick Attach Ports | U.S. 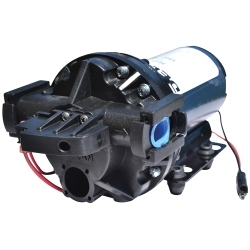 Plastic Corp.
Motor type: 12 VDC, permanent magnet, totally enclosed, non-ventilated. Leads: 18 AWG, 12" long. Temperature Limits: Motor is not equipped with thermal protection. For user safety, optimal performance, and maximum motor life, the motor surface temperature should not exceed 150°F (66°C). 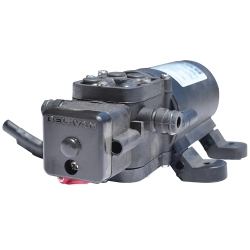 Pump type: 3 chamber positive displacement diaphragm pump, self-priming, capable of being run dry, demand model. Certifications: NSF Standard 58. Liquid temperature: 140°F (60°C) maximum. Priming capabilities: 14' (4m). Max pressure: 60 psi. Inlet/outlet ports: Quick attach. Materials of construction: Polypropylene housing, Santoprene™ diaphragm, Viton™ valves, stainless steel fasteners. Weight: 6 lbs (2.7 kg).